The Ring illustrated on Plate X, No. 132, is Byzantine, and was worn as an Amulet for protection against disease and accident, the grotesque head being against the Evil Eye; the seven radiating spirits symbolise the seven gifts of the Spirit - Power, Wisdom, Honour, Glory, Blessing, Strength, and Riches. Round the hoop is engraved the inscription, "Lord preserve the wearer". "After possibility follows certainty, the seventh moon is at hand". The seventh New Moon of our Calendar would fall in Cancer, the Moon's own Zodiacal house in which she is exalted, or at her strongest, and when there marks a very auspicious time for pushing public affairs or undertaking new business enterprises (see Illustration No. 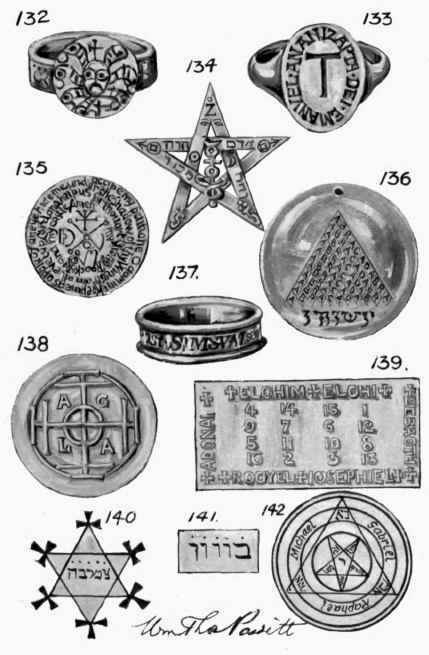 137, Plate X). The most famous Talisman, however, of the Middle Ages is the Abracadabra, which, says the Rev. C. W. King, was first mentioned by Serenus Sammonicus, the most learned Roman of his time, and physician to Caracalla. Serenus Alexander, a great admirer of Serenus Sammonicus, ordered the word to be written in the form of an inverted cone, and declares it to be of virtue against all diseases. "Thou shalt on paper write the spell divine ABRACADABRA called in many a line, Each under each in even order place, But the last letter in each line efface, As by degrees the elements grow few, Still take away but fix the residue, Till at the last one letter stands alone, And the whole dwindles to a tapering cone. Tie this about the neck with flaxen string, Mighty the good 'twill to the patient bring, Its wondrous potency shall guard his head And drive disease and death far from his bed". The Illustration No. 136, Plate X, is from an example in the British Museum, and the probable origin of this Talisman is that it is a composition of the Hebrew words Ha - Brachab - Dabarah - "Speak or pronounce the Blessing"; "Blessing" standing for "The Blessed One," being equivalent to invoking the Holy Name of Jehovah. "Mr. Banester sayeth that he healed two hundred in one yer of an ague, by hanging Abracadbra about their necks, it would stanch blood or heal the toothache although the parties were ten miles off". Other writers affirm that in order to cure mild attacks of ague it is only necessary to repeat the word Abracadabra, dropping each time one letter, but in severe cases the word was to be written as prescribed and eaten by the patient!